I live in a condo complex of individual units but, as you can imagine, we are limited in what we may do to make our homes look “different.” Originally you were only allowed a white front door and, in fact, my home was the first one with a screen door (my BFF’s mom was the owner and my BFF asked for the screen door- since it was the model unit, and only two other units had been sold…she got it). Well, a few years ago a board member decided she was tired of her white door and proposed to the rest of the board that they change that by-law. Never mind that the board doesn’t have the power to do that (I was NOT going to educate them on this fact…let them “pass” their new by-laws that would never hold up to a legal challenge). Well, they forgot one little detail….to include a limited, approved palette of colors. So, the dark blue and the maroon and other sedate colors showed up….and I painted MY front door….lime green. Guess what? 4 years later I am still the only one with a lime green door or anything not sedate…I’m also the only one with a fenced in and landscaped backyard altho two doors down there is now an in-ground pool…..I love to be different. 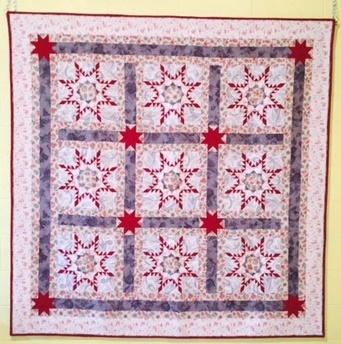 Oh, and I rarely do a quilt using traditional blocks. If I do it’s likely to have weird colors or a strange layout. Mostly I just make one-of-a-kind art quilts…Quirky is my middle name…. I grew up in hand-me-downs and was never in style. I completely failed childhood 101 both at school and at home. I was rejected by my college sweetheart’s mother as not being “good enough” for her son. The best thing that ever happened was coming to Japan. There were few foreigners in those days and the only expectations were to be “different”. That, I could do just being myself. My in-laws loved my uniqueness. My quilting has all been made up . I have used patterns only twice and changed nearly everything so as to be hardly recognized. I love to live and think outside the box. I always thought there must be something wrong with me because I could never seem to stick with a pattern, with very few exceptions like Dear Jane LOL 😉 Some applique is also an exception for me, as I can’t seem to draw even the easiest of shapes. But settings, colors and fabrics make each quilt unique and special for me. Becoming older, I just dare more and more to be different !